On February 5th, the Graduate School of Arts & Sciences at Wake Forest University hosted its annual Chinese New Year dinner, attracting close to 100 WFU students and faculty members. 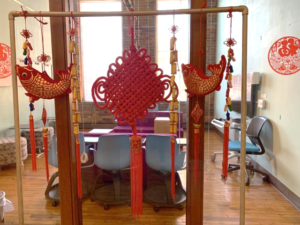 In Chinese culture, the year of the pig stands for wealth and prosperity. As a tradition, graduate students from the Interpreting and Translation Studies Program help decorate the Graduate School Brookstown Campus weeks before the New Year’s Eve celebration. The celebration ended with an exciting raffle in which some of the lucky attendees received red envelopes with Starbucks gift cards. 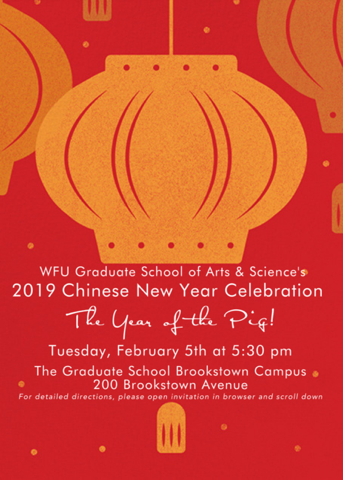 Since 2016, celebrating the Chinese New Year with genuine Chinese food and Chinese folk arts has become an important annual Graduate School event.